Boliviana de Aviacion Boliviana de Aviación, often referred to as simply BoA, is the flag carrier airline of Bolivia and is wholly owned by the country's government. It was established in October 2007 and began operations in March 2009. The airline is headquartered in Cochabamba with its main hub at Jorge Wilstermann International Airport and focus cities at El Alto International Airport and Viru Viru International Airport. Most international flights, however, including long-haul services to Madrid and Miami operate out of Viru Viru in Santa Cruz de la Sierra. 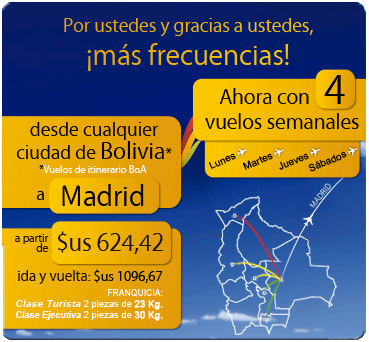 Boliviana de Aviación currently flies to 13 destinations in 5 countries and is the largest airline in Bolivia in terms of fleet size and passengers carried.